Gautom (pictured above, on the left) is from Coimbatore in southern India. He came to Oxford Brookes to study Business and Management in 2000 and graduated in 2004. 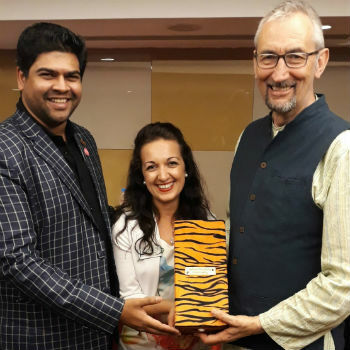 Since returning to India he has pioneered the use of student discount cards and in 2016 launched the country’s first premium rum, Wild Tiger. “My time at Oxford Brookes paved the way for many good things and many great connections. My best experience was being involved with the Students’ Union. I was elected as the Ethnic Minorities Officer. We celebrated Black History Month – the first time a full calendar of events had been put on for it at Brookes. “I ran for a full-time Students’ Union post in 2004. I finished second but one of my ideas was for a 24-hour library. Back then people thought I was crazy but now it is 24-hours so I like to think that’s a legacy of my campaign. “Another thing I did at Brookes was launch the Oxford Student Card. It gave discounts between 5 and 25 per cent. I took that idea back to Coimbatore and launched a student card there with a lot of initial success. It was very ahead of its time although now offering great deals is very popular. “My family had been in the alcohol business for two decades at this point. I was very averse to the industry and had been a teetotaller for the whole time I was in Oxford. But while my dad was recovering from a health setback, I got involved with the business. “We were producing rums for other brands but didn’t have a brand of our own. We were building someone else’s dream and that was not something I was interested in doing! “I felt we should develop our own brand and create our own story. I got involved with the rum community and studied for industry certification. We weren’t ready to launch immediately but finally we did in 2016. “I called our rum Wild Tiger because I am a tiger enthusiast. But also because it is the Indian national animal. A lot of consumers don’t relate India to rum. They feel it is very Caribbean. But history points the origin of rum to ancient India so we want to build that association - India is known as the ‘Land of the Tiger’. “A century ago there were 100,000 tigers in India. Now there are 2,200. It is a national embarrassment. As a brand we benefit from tiger imagery and the name, so the least we could do is give back. We’ve set up a non-profit called Wild Tiger Foundation, and some of the money from sales of rum goes into that. We work with tiger reserves, are mentored by India’s leading tiger expert and have partners on the ground to advise on spending the funds. “Wild Tiger Rum is in 22 countries as well as duty-free. It has been good so far – with successes and some initial failures. But there is no such thing as a runaway success. It’s a journey I’m enjoying and have a lot of great learning to share with people carving their own venture as an entrepreneur. “My advice to current students is to embrace the experience. Marks are important of course but it’s not all about books. Don’t underestimate the person in front of you. Talk to them – you never know who they might be. At Brookes we hope that too – and also hope Wild Tiger Rum will be available in the UK soon.